With only one postponed match left to play which will have no bearing on the final outcome, DENHAM VILLAGE A dismissed Rickmansworth A 9-1 in their final match thanks to unscathed performances from their regular trio of Mitchell Jones, Danny Lewis & Rhys Thoroughgood, to become this year's Division 1 champions. Many congratulations to them. Although it was a close contest from the outset, Chiltern have to settle for the runners-up position, just 4 points in arrears. As was already mentioned last week, DENHAM VILLAGE D are this year's Division 2 championships, & we congratulate them. Hillingdon had a splendid inaugural season in our league & comfortably secured the runners-up position. Only one player in each division managed to successfully maintain an unbeaten run, Mitchell Jones of Village A & Gaurav Aravind of Village D. The play-off match will be between Hillingdon & Chalfont B. The FAIRBANK CUP Final will be contested by Denham Village B of the first division & Denham Village F of the second. Village B beat Chalfont B, 5-2, in the semis whilst Village F prevailed over siblings Village H by 5-1. The final will be played on Tuesday 31st March at the CSP Parish Church Hall, Church Lane, Chalfont St. Peter, & we look forward to welcoming as many of you as possible. The first division title is still in the balance. Chiltern have wrapped up their matches with a blistering 10-0 score against third placed Denham Village B, thanks to an emphatic performance from Chris Haines, Lawrence Chamberlain & the ever dependable Mark Croucher. They have set their marker of 137 points for Denham Village A who are 5 points astray to aim for in their last match against Rickmansworth A. Unfortunately the latter had to postpone as they were unable to raise a team, & so keep everyone in suspense. Chalfont A played out an honourable draw against Rickmansworth B, with Chalfont's Ian Hopkinson & Ricky's Andy Miller winning both their matches but unfortunately having to forego the third as Andy was in no state to continue due to a severe recurrent back injury. A huge surprise in the local derby between Chalfonts B & C, as Frank Cowley finally shone through in his last match by winning all his sets & capturing the scalps of a couple of very useful players in the process, but his C team still had to give second best 6-4. DENHAM VILLAGE D are the undisputed champions of Division 2, as James Johnson & Mick Lowens returned clean sheets in slamming 9 past Village G to accumulate a final tally of 150 points, 11 ahead of their nearest rivals Hillingdon who just managed to scrape through 6-4 against the Village J juniors whose star player Lee Clark, 2nd in the averages on 96.15%, was far too hot to handle. Rickmansworth C came badly unstuck at home to Village J, giving 9 points away to unblemished performances from David Cottle & Carys Evans, whilst the junior girls of the Village H team gave third placed Village E a real fright, holding them to a good draw despite maximum points from captain Bob Baines. With just one round of matches to go the Division 1 title has still not been decided. Denham Village A lead Chiltern by 5 points and have yet to play Rickmansworth A, whilst Chiltern have to face Denham Village B in their final match. Village A made short thrift of Chalfont A, beating them 10-0 thanks to maximum points from their top trio Mitchell Jones, Danny Lewis and Rhys Thoroughgood. Chiltern had a bye. Denham Village B have comfortably secured third spot having beaten a two-man Rickmansworth A team in their penultimate match, 7-3, all three points being bagged by Ricky's Kevin Williams. Village C comfortably put 7 past Chalfont B thanks to 100% performances from little Shae Thakker and captain Richard Cottle, whilst 2-man Chalfont C did well to get a couple of points from the Rickmansworth B team for whom Mardik Babaian & Vigen Behroozi kept clean sheets. Bar a minor disaster against Village G in their last match, this year's champions of Division 2 look to be Denham Village D who beat yet another 2 man Rickmansworth C team 6-4, helped by an unblemished performance from Mick Lowens. Hillingdon's Steve Keyes, George Reidy & Sue Merican showed no mercy in their whitewash of struggling Rickmansworth D who have not managed a win all season, and have secured the runners-up position in the process with still a match in hand. Denham Village E look to have secured third spot by thrashing the Village J juniors, 9-1, thanks to Max Pennington & Ollie Kimmins who won all their matches, and Village F went a step better by dealing struggling Ickenham a 10-0 blow courtesy of David Cottle, Carys Evans & Shaun Bausor. Denham Village G were a tad too strong for siblings Village H, a clean sheet from Joe Griffiths helping them onto an 8-2 result. The Championships results, report & photos are on the Championships page. The handicapping proved accurate in general as 12 of the sets went to 3 games apiece. The match between Chalfonts B and C was closely fought but captain Barry Ferguson managed to steer his B team to a 5-3 victory by winning all three of his sets, and similarly Ben Naylor-Smith came through unscathed in his three sets to produce the same result for Denham Village B against siblings Village D. However, the other two matches were somewhat one-sided due mainly to the overpowering strength of their respective junior protagonists playing as third strings respectively. Top player in the league on 100%, Mitchell Jones proved far too strong for the experienced Chiltern players as he led the Village F team to a 5-1 result, although Carys Evans also played her part, both players winning their 2 sets. Likewise, the Rickmansworth A players were no match for Danny Lewis, lying just behind Mitchell on an average of 96.67%, as he and Rachel Stones also won their 2 sets to produce the same result for Denham Village H.
Denham Village H face Village F in one semi-final whilst Chalfont B play Village B in the other. With just one match left to play, Chiltern are 14 points ahead of Denham Village A who have played 2 fewer matches, so the Division 1 title is still open although Denham Village have the edge, but they need to win their remaining fixtures handsomely. Chiltern dropped 2 points against a 2-man Rickmansworth A team, with Mark Croucher and Lawrence Chamberlain keeping clean sheets, however Village A dropped just 1 point against bottom of the table Chalfont C, with the honours going to Rhys Thoroughgood and Gaurav Aravind playing up. Denham Village B put 8 sets past Chalfont A, thanks to 100% performances by father and son Nigel and Ben Naylor-Smith, which should guarantee them third spot this year, whilst Rickmansworth B had a disastrous evening away to the Village C team, losing all 10 points in a match in which 3 sets went to 5 games. In Division 2, Rickmansworth C had a comfortable 8-2 victory against Village G, Howard Atkins and Andrew Grassick coming through unblemished, but their siblings Ricky D went down by the same score against Village E with captain Bob Baines showing the way home. Hillingdon effectively made sure of the runners-up position by beating Denham Village F, 7-3, their star on this occasion being George Reidy, whilst the girls of Village H were a tad too strong for the Village J juniors, winning 7-3 thanks to Georgina Cooper's 100% display. All three matches played in Division 1 resulted in clean sweeps. Chiltern beat Chalfont A to go 15 points ahead of Denham Village A but have played 2 extra matches, captain Mike Atkinson being ably supported by regulars Mark Croucher and Chris Haines. Denham Village B beat Chalfont C with limited opposition facing Ben Naylor-Smith, Steve Brown and Simon Barnes, whilst Rickmansworth's Bob Laker, Vigen Behroozi and Dave Sims showed no leniency to the 2 players representing Chalfont B. In the second division, Denham Village D could also only field 2 players and consequently lost their first match of the season, going down 4-6 to second placed Hillingdon. The Rickmansworth C team of Nicholas Currey, Howard Atkins and Cefyn Jones dealt another severe 10-0 blow to the girls from Denham Village H, whilst Denham F's captain Shaun Bausor had a field day winning all his singles and a share of the doubles and helped his team to a 6-4 victory over Denham Village E. Struggling Ickenham URC notched up a welcome 7-3 win against Denham Village G who could only muster 2 players, thanks to experienced campaigner Bill Honour who won both his matches. Division 1 current leaders Denham Village A had an emphatic win against Chalfont B to consolidate their position, thanks to 100% scores by Danny Lewis and Rhys Thoroughgood, although they did drop a point. Villages B and C had a very close tussle, the result going B's way, 6-4, the only 100% performer being their rising junior star Ben Naylor-Smith. Luckless Rickmansworth A ran out of players and could only turn up with their captain Shashin Shah at Chalfont A but still managed to secure 2 points. Meanwhile in Division 2, Rickmansworth C dealt Ickenham URC a heavy 10-0 blow thanks to their trio Howard Atkins, Cefyn Jones and Nicholas Currey, whilst Denham Village D went on their merry way to an almost certain title by dismissing siblings Village E, 9-1, courtesy of Mick Lowens and still unbeatable junior Gaurav Aravind. Another tight match was played between Villages J and F, with the former securing a 6-4 win, Lee Clark putting in another flawless performance by winning all his singles and a share of the doubles. The junior girls of the Village H had a successful visit to Rickmansworth where Rosalind Lane put in a 100% performance to beat the Ricky D team 7-3. A round of many very closely fought and exciting matches, with five producing 5-3 results. Chiltern rallied back from 1-3 down to beat Ickenham 5-3, with four sets going the full distance and Chris Haines coming through unscathed. Denham Village J fought back from 1-3 down against the Denham H girls to draw level only to lose the last two sets, with four sets going to 3 games apiece, the star of the H team being Georgina Cooper who won all her 3 sets. Only five sets were played, four of which needed 3 games apiece, when Rickmansworth could only turn up with 2 players, Kevin Williams and Shashin Shah, against Chalfont A, but the lads did the job by winning all their sets to put Ricky through to the quarterfinals 5-3. Another thriller in which five sets went all the way, was played between Villages B and C, the former getting home 5-3, courtesy of an unblemished display from their star Ben Naylor Smith who won his 3 encounters. Dave Morgan excelled in his 3 sets and guided his team Chalfont C to a 5-3 victory against Denham Village E, whilst Carys Evans helped Denham Village F defeat their G siblings 5-2 by winning her 2 sets. A 2-man Village A team decided to throw in the towel after playing just 3 sets against Village D who won 5-1, whilst Rickmansworth B were in an even worse plight when only one player turned up at Chalfont B who claimed the walk-over. The results can be seen on the Fairbank Cup page. The draw for the quarter-finals will be made at the next committee meeting on February 19th. Chiltern Maintained a 4 point lead over Denham Village A at the top of the first division, both teams having scored 10 points this week. Chiltern demolished Denham Village C thanks to their trio Chris Haines, Mark Croucher and captain Mike Atkinson, whilst Village A's points came by way of a concession by Rickmansworth B who found themselves left with just 1 player within 5 hours of the start of the match. Denham Village B had a comfortable 8-2 win over Chalfont B, their youngster Ben Naylor-Smith putting on a splendid 100% display, whilst Rickmansworth A battled with just 2 players (yet again) to beat Chalfont C, 7-3, thanks to maximum scores from Kevin Williams and Shashin Shah. In Division 2, Denham Village F bagged all the points against struggling Rickmansworth D, courtesy of David Cottle, Carys Evans and Shaun Bausor, whilst Denham Village E dished out the same treatment to siblings Village G, their youngsters Ollie Kimmins, Max Pennington and Harry Wilcox showing them their clean heels. Denham Village H had an equally emphatic 9-1 victory of Ickenham URC, with unbeatable performances from Rosalind Lane and newcomer Mitchell Pidgeon who is just 12 years old. Rickmansworth C managed just 2 points against second placed Hillingdon for whom George Reidy won all his singles and a share of the doubles, whilst leaders Denham Village D surprisingly only managed to share the points with the youngsters of Village J whose top player Lee Clarke showing the relentless form that has put him at the top of the averages. The first round of league matches in 2015 produced one or two unexpected outcomes. The race at the top of Division 1 is hotting up with Chiltern taking over the reins from Denham Village A, having inflicted their first defeat by reversing the score of their previous encounter, 7-3, in their postponed match. Danny Lewis finally relinquished his 100% record at the hands of Mark Croucher who scored a maximum. Chiltern also defeated Rickmansworth B, 8-2, in a second postponed match with another unblemished performance from Mark, & whitewashed Chalfont B in their scheduled match with yet another clean sheet from Mark, replicated by Mike Atkinson and Lawrence Chamberlain. A 2-man Rickmansworth A team managed to pick up 4 points against Village C thanks to a flawless display from Kevin Williams, whilst the Ricky B team succumbed to Village B, 2-8, in a very tight match with Nigel Naylor-Smith and Simon Barnes securing all their singles and doubles points. Chalfont A breezed through against their B siblings, 9-1, with Ian Hopkinson and Mark Scholfield winning all their matches. In Division 2, Denham Village D thumped Rickmansworth D, 10-0, thereby consolidating their lead, courtesy of maximum points from their normal trio of Scott Thompson, James Johnson and Mick Lowens. Two further whitewashes were inflicted by George Reidy, Daniel Toppin and Ali Tanberk of Hillingdon over Ickenham URC, and by David Cottle, Shaun Bausor and Carys Evans of Village F over siblings Village H. The final match between Denham Villages G and J was a much closer affair won narrowly by the G team, 6-4, helped by a clean sheet from their player Joe Griffiths. Only two matches were played, the third unfortunately conceded. Rickmansworth C had a close fought encounter with Denham Village J, the scores going one way then the other and 3 matches going the full distance, until Village J finally settled the outcome at 5-3 with only Michael Job coming through unscathed. The other match between Hillingdon and the juniors of Denham Village C was equally exciting albeit not reflected by the final score as 3 matches went to the fifth set and another resulting in 22-20, 22-20. Shae Thakker and Jemma Walker won all their matches to give Village C a 5-1 victory to put them in the second round. Please note that the player handicaps for the Fairbank Cup have now been completed and can be viewed on the Fairbank Cup page of this website. Having completed all bar 4 postponed matches prior to the Christmas break, a definite trend is beginning to unfold in each division...... 2 teams are running away at the top whilst 2 teams are being detached at the bottom. In the first division, the fearless juniors of Denham Village A, Danny Lewis & Mitchell Jones, power on relentlessly as they win in straight sets in dismissing their Village B siblings by 9-1 & opening up a gap of 8 points over rivals Chiltern despite the latter's 10-0 demolition of a 2-man Rickmansworth B team, courtesy of Mike Atkinson, Mark Croucher & Chris Haines. Village C leap into third spot by sweeping aside the top Chalfont team 8-2, thanks to maximum points from James Whitfield & long-time campaigner Roland Stanbridge. All the matches played in Division 2 produced 8-2 results.....pace-setters Denham Village D were easy winners over Village F & have built a massive 15 point lead over Hillingdon (whose match was postponed), their star junior player Gaurav Aravind chalking up yet another maximum & now topping the averages with 12 wins in 12 matches. Rickmansworth C had a handsome win against Village J, thanks to a 100% display from their junior Andrew Grassick who finally put pay to Lee Clark's unbeaten record. Bob Baines exceeded all expectations by emerging unscathed in steering his Village E team to victory over Ickenham URC & keeping them firmly in third spot. The thus far invincible young duo, Danny Lewis & Mitchell Jones of Denham Village A, notched up another perfect score to beat their nearest rivals Chiltern & widen the gap to 9 points at the top of the first division. Ricky A maintains third spot having scrambled a draw against siblings Ricky B whose latest star Cedric Felder put on a class act by emerging unscathed. Denham Village C hammered Chalfont C, 10-0, courtesy of Richard Cottle, Roland Stanbridge & Timur Hashimi. In Division 2, pace setters Denham Village D didn't have it all their own way against the Village H girls, conceding 2 points, although their leading scorer 14 year old Gaurav Aravind scored maximum points in his third consecutive match, showing that he is another young force to contend with. Hillingdon maintained their runners-up position by putting 7 past third placed Denham Village E, whilst top of the leader board Lee Clark keeps his 100% record as he and Bradley Kennedy bagged maximum points in a comfortable 7-3 victory for Village J over struggling Ickenham URC. The local derby between Ricky teams C & D went C's way by an emphatic 9-1 score line, thanks to clean sheets from Howard Atkins & Andrew Grassick, whilst another derby between Villages F & G resulted in a narrow win for the F team by 6-4 thanks to yet another unbeatable display from David Cottle, his third in a row. 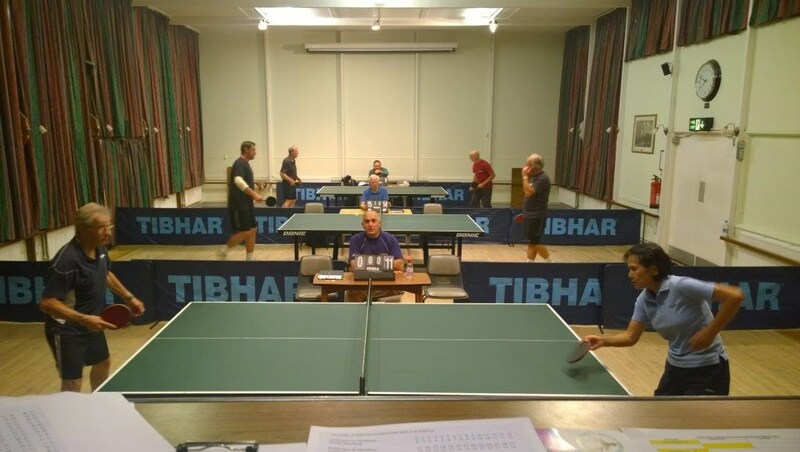 Somewhat belatedly, I would like to report on a very successful pre-season competition which took place at the Chalfont Community Centre on Friday 12th September. 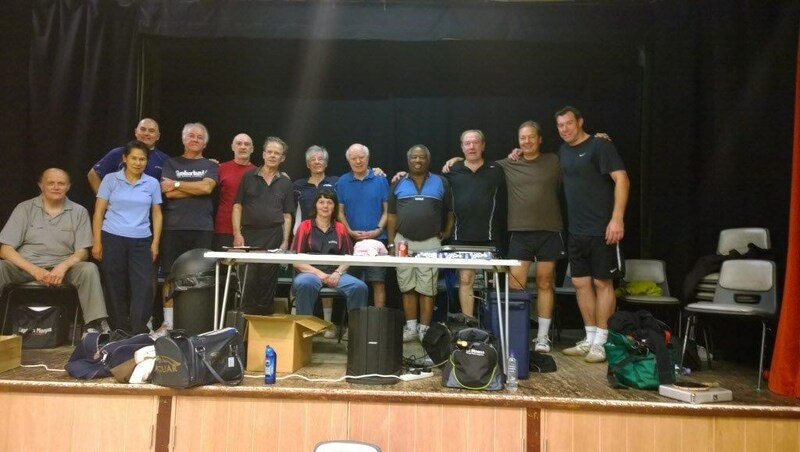 A brainchild of Chris Lee, captain of the Chalfont A team, this was a closed handicap tournament involving singles and doubles events, in which 11 players participated across 3 tables, supported by umpires Dave Swift and David Stephan, and stalwart Ken Marshall. For his first attempt, Chris must be complimented on an extremely well organised and enjoyable evening. The handicapping was spot on, as witnessed by several closely fought matches which went the full distance, and a great time was had by one and all. Hopefully this will encourage other clubs to follow suit as there is evidently hunger and enthusiasm for such events. Maximum points from Mark Croucher helped to steer Chiltern to a 6-4 victory over the B team from Denham Village despite encountering some stiff resistance, & this has consolidated Chiltern's second spot in Division 1 behind leaders Village A whose match was postponed. Both these teams have 2 matches in hand & are beginning to build an a unassailable lead over the rest. In a long match which went past 11 p.m. Rickmansworth B were locked in battle with Chalfont A & eventually had to surrender 4-6, thanks to an unblemished display by Nick Lee. Chalfont B however had a fairly easy 8-2 ride against siblings Chalfont C with Bas Mocharrafie & Ron Bryant doing the honours here. A whitewash by Denham Village D over their G siblings has opened up a daunting 16 point gap at the top of the second division at the half way stage, as their trio of Scott Thompson, Gaurav Aravind & James Johnson swept all aside. Three matches produced 6-4 results....the Village J juniors had a splendid win against useful contenders Hillingdon, championed by Lee Clark who maintains his 100% average, whilst the C & D Rickmansworth teams went down to Village F & Ickenham respectively with the honours going to David Cottle & Bill Honour (who else!). It was obviously a good night for David as he repeated his performance along with Ollie Kimmins on the adjacent table as Village E romped home 8-2 against the Village H team. We have now effectively completed the first half of the season with not too much mishap, & can look forward to part 2 & the opportunity to seek revenge in the return matches! There were two whitewashes this week. In Division 1 Rickmansworth B's trio Dave Sims, Vigen Behroozi & newcomer Frenchman Cedric Felder visited Chalfont C & returned unscathed. Denham Village A stumbled away to the top Chalfont team by dropping 3 points, but their junior stars Danny Lewis & Mitchell Jones marched on relentlessly by maintaining their unbeaten record of 18 & 15 winning matches respectively. The Village C team won comfortably against Chalfont B, 8-2, only James Whitfield putting in a 100% performance, whilst a tight match between the Ricky A & Village B teams produced a 6-4 victory for the former despite a splendid showing from Village's ever improving junior Ben Naylor-Smith who maintained a clean sheet. In the second division, the relatively inexperienced newcomers of the Ricky D team were no match for the Hillingdon team of Daniel Toppin, Ali Tanberk & George Reidy as they managed just one leg in a 10-0 thumping. The Ricky C team did a little better, scoring 2 points against leaders Village D who had yet another promising youngster, 14 year old Gaurav Aravind showing a clean pair of heels in his first match. The remaining matches were pretty close affairs....the E & F Village teams both scored 6-4 against Village J & Ickenham respectively, although the maximum points were produced by players on the losing sides, Lee Clark of Village J & Bill Honour of Ickenham. The final match ended in an honourable draw between Villages G & H, the former's Joe Griffiths showing how it's all done by winning his 3 singles & a share of the doubles. Another whitewash for Denham Village A as they dropped just 3 legs against Chalfont C & further consolidated their lead in Division 1, their unbeaten duo Danny Lewis & Rhys Thoroughgood being joined on this occasion by Richard Cottle, playing up. Both Rickmansworth teams, A & B, went down by the same score, 8-2, to Chiltern & Denham Village C respectively. Rickmansworth A did well considering they could only manage 2 players, but Chiltern's Sam Nolan emerged unscathed, whilst Ricky B's marathon encounter with Village C was a lot closer than the score would suggest, 4 sets going to 5 games, but Richard Cottle scored another maximum as did Roland Stanbridge; it was well past 11 pm when this match was finally completed. Chalfont A, thanks to a superb 100% performance by Nick Lee, were the somewhat surprise 6-4 winners at Denham Village B. Two maximum scores were recorded in Division 2, the first by Denham Village D over Ickenham URC, courtesy of Scott Thompson, James Johnson & Mick Lowens, & the second by Denham Village E over newcomers Ricky D, with Ollie Kimmins, Max Pennington & David Cottle (playing up) doing the damage. A 100% performance from Rosalind Lane helped her Village H team to a good 7-3 victory over Village J, whilst Ricky C combined well to see off the Village G team by the same score despite Bradley Kennedy winning all his games playing up. The last match produced a very comfortable win for Hillingdon as they dropped just 1 set in their visit to Denham Village F, with George Reidy & Ali Tanberk putting in faultless displays. Far too early to draw any conclusions yet, but a pattern is beginning to emerge not dissimilar to this time last year, where 2 teams are setting the pace in both divisions. Denham Village A and Chiltern are beginning to show a clean pair of heels, the former leading by just 2 points at the top of the first division. Village A dropped just the doubles against their sibling C team, their hitherto undefeated trio Danny Lewis, Mitchell Jones and Rhys Thoroughgood soldiering relentlessly on, whilst experienced campaigners Chiltern dropped 2 points against Chalfont A, their captain Mike Atkinson showing why he is still the man to beat. Chalfont C were no match for the Village B team who swept them aside, 10-0, courtesy of Steve Brown, Simon Barnes and Nigel Naylor-Smith, whilst Rickmansworth B narrowly defeated Chalfont B, 6-4, their leading player Dave Sims keeping a clean sheet. The games in the second division were much closer affairs in which three matches registered scores of 7-3, and the other two 6-4. The much awaited encounter between the leading contenders Village D and Hillingdon went Village's way, 7-3, the only maximum score coming from 14 year-old newcomer Lee Clark playing up from the J team. Thirteen year-old Max Pennington put in another 100% performance as did his team mate 14 year-old Ollie Kimmins to notch up a 7-3 win for Village E over Village F, & put them firmly in third spot. The two Rickmansworth teams had mixed fortunes....the C team scraping home 6-4 against the Village H girls, thanks to an unblemished performance from Welsh wizard Cefyn Jones, while their D team went down 7-3 to the junior boys of the Village J team, with another impressive maximum score from Bradley Kennedy. In the final match, pen holder grip player Fanny Speck brought home the bacon for Village G in a good 6-4 win at Ickenham. The two most likely contenders for this year's Division 1 title, Denham Village A and Chiltern, consolidated their bids with emphatic 10-0 results. The regular young trio of Village A, Danny Lewis, Mitchell Jones and Rhys Thoroughgood, maintained their 100% records by brushing aside the Chalfont B players with 9 of the sets going to 3 games each, whilst Chiltern encountered slightly more resistance against a Chalfont C side but nonetheless their trio of Mike Atkinson, Mark Croucher & Sam Nolan managed to keep a clean sheet. The match between siblings Denham Villages B and C produced a comfortable 8-2 win for the higher ranked team as expected, with Steve Brown and Gerry Hawkins getting maximum individual points, while current leaders Ricky A scraped home 6-4 against the top Chalfont side, the only perfect score of the night coming from Ricky's Russell Davies. With all ten teams of the second division having played 5 matches so far, Denham Village D have now opened up a gap of 7 points over second placed Hillingdon, both teams having won all their matches. Thirteen year old Max Pennington of the Village E team finally relinquished his hitherto unblemished record to long time campaigner James Johnson of Village D, who was the only player to score maximum points and help his team to an 8-2 victory. Hillingdon meanwhile dropped just one set against Denham Village G, no mercy being shown by Sue Merican and Steve Keyes. Despite a splendid performance from 14 year-old newcomer Lee Clark who won all his games playing for the Village J team, they were kept at bay by the more experienced Village F team who got home 6-4, whilst Ricky C went down by the same score line to Ickenham URC despite Howard Atkins' clean sheet. An awesome display by the brilliant junior trio of Denham Village A, Mitchell Jones, Danny Lewis & Rhys Thoroughgood, giving them their second whitewash in two outings, has announced the team's firm intention to claim this year's League Division 1 title. The unfortunate Rickmansworth B players battled hard but could offer little resistance. Chiltern have finally made their entrance after postponements in the first 2 rounds, with an emphatic 9-1 demolition of the Village C team, courtesy of maximum points from captain Mike Atkinson and Andy Misseldine whom we warmly welcome back after a long absence. There was an equally convincing win by the Village B team over the Chalfont B team, who registered another 9-1 score line, thanks to a full house from captain Steve Brown and Simon Barnes, whilst Rickmansworth A had a fairly easy 8-2 victory away to a 2-man Chalfont C team, Shashin Shah and Kevin Williams again doing the damage here, to give them a 7 point lead at the top of the division, albeit having played extra matches. The results in the second division were a little less dramatic, where the teams were more competitively matched. The Village F team overcame Rickmansworth D, 7-3, thanks to an unblemished performance by David Cottle, whilst Ickenham URC registered their first win in 4 outings by a similar score against the Village H girls, thanks to maximum points from long-time campaigner Bill Honour. The remaining encounter produced a narrow 6-4 victory for Village E over Village G, with yet another scintillating display from young Max Pennington who did not drop a set and who has won all 4 matches played so far. The top two teams of Division 1 have swapped places, with Chalfont A now taking the lead over Rickmansworth A by a single point after their comfortable 8-2 win over siblings Chalfont C, thanks to maximum points from returning top player Mark Scholfield. Ricky A scraped through against Denham Village C, 6-4, the star of the show here being Ricky's Kevin Williams who won all his singles & contributed to the doubles win as well. An extremely close tussle between Denham Village B & Ricky B eventually produced a 7-3 result around 11 pm with Village B shaving the last incredibly exciting doubles match 19-17 in the fifth, the only player emerging unscathed on the night being Village's captain Steve Brown. An emphatic 9-1 victory by newcomers Hillingdon away to Ickenham has put them firmly in the driving seat of Division 2, courtesy of clean sheets from George Reidy & Steve Keyes. Trailing them by 3 points in second place are Village E who had a fairly comfortable night away to Ricky C, winning 8-2, their star junior player Max Pennington retaining his 100% average & solidly heading a list of 39 players, having so far played 9 & won 9. The remaining matches both produced 7-3 results, the Village H girls going down to Village F thanks to captain Shaun Bausor who bagged maximum points, and the Village J boys conceding to Village G, the 3 points being secured by 14 year-old Bradley Kennedy who is showing vast improvement with every match. Into the second week & we have 2 more postponed matches to add to one from last week, 5 players who have already played up, & one team who could only turn up with 2 players, all of which does not add up to a very encouraging start to the season. Hopefully though things should settle down soon with everybody back from their holidays. No real surprises for the 2 matches played in Division 1; despite little Shae Thakker winning all of his matches for Denham Village C & maintaining his 100% record, his team still went down 3-7 to the experienced campaigners of the Chalfont A team. They now trail Rickmansworth A by one point at the top of the table, Ricky having demolished the Chalfont B team 9-1. In the second division, thirteen year old Max Pennington is another of our up & coming juniors who is hanging onto his 100% record, winning all his matches in Denham Village E's comfortable 8-2 win over Ickenham URC, whilst newcomers Hillingdon recorded the same score against the young lasses of the Village H team, courtesy of maximum points from Tomini Phillips & George Reidy. Our other newcomers, Rickmansworth D, suffered their second loss but only by the narrow margin of 4-6 to the Village G team, thanks to the latter's only pen holder in the league, Fanny Speck, who kept a clean sheet. Finally, a welcome return to the scene of James Johnson, who combined with his Village D team mates Scott Thompson & Mick Lowens to whitewash the 2 Village F players & build an early lead of 5 points over Hillingdon at the top of the division after only the second week of play. It is always a relief to report that the first week of the season was completed without any pitfalls or oversights. Bar one bye and one postponement, the remaining teams all played their matches successfully, 2 players already having played up into higher teams. In the first division matches went according to plan, the Chalfont A team beating the B team 7-3 without any player registering a maximum score, and Ricky A with a player short getting the better of Ricky B, 6-4, their captain Shashin Shah winning all his matches. Shae Thakker, just turned 11, linked up with old campaigner Roland Stanbridge to score maximum points and guide Denham Village C to an 8-2 win over Chalfont C and put them at the top of the table at this early stage. In the second division 2 teams registered 9-1 wins, Denham Village D overpowering their H siblings thanks to 100% performances from captain Scott Thompson and Mick Lowens, and Ricky C being a tad too strong for their newcomer D siblings courtesy of clean sheets from captain Nicholas Currey and Cefyn Jones. The latest team to be welcomed into our league, Hillingdon, got off to a winning start against the Denham Village E team, beating them 6-4 despite a full house from E's 13 year old Max Pennington, whilst the final match between Villages F and G produced an honourable draw with newcomer Joe Griffiths playing for the G team winning his 3 matches. Here we are once again, about to embark on a new season which commences on September 29th. I hope that you had a good summer and are fit and ready to resume battle! Although we have lost 2 teams from last year, CSP Academy PP and one of the Chalfont teams, we are fortunate to welcome 2 new teams this year, Hillingdon and a fourth Rickmansworth team, so we have retained 19 teams in total. At this moment we have exactly 100 registered players, but traditionally we can expect this to increase by at least another dozen by the January 31st deadline. There will be a few changes of venues....we have lost Higher Denham and the Chalfont Community Centre, but gained Hillingdon and the CSP Parish Church Hall, and regained Harefield Academy and Dr Challoners Girls' School. You should all be in possession of our new handbooks by now, beautifully designed by Jim Carpenter, to whom we are greatly indebted as always. Due to a majority decision at this year's Club Secretaries' meeting, we will be maintaining the same 2 divisional league structure as last year which was generally considered to be quite successful. Enjoy the new season, and GOOD LUCK! We continued to face the same persistent issues last year as in previous years, and you are once again requested to ensure that these are kept to a bare minimum please because they cause unnecessary headaches. Thank you. Missing scores, where either game or set scores have not been entered. Incorrect scores, where the games do not agree with the sets. Reversed scores, entered for home instead of away players, and vice versa. Missing or wrong team names, dates, match results, etc. Missing doubles players – the most common fault. (a (a) Home team captains must send a postponement card notification within 3 days of the match date otherwise 2 league points will be deducted. (b (b) Postponing team captains must send notification of the rearranged date within 3 weeks of the match date otherwise 5 league points will be deducted. Please remember that it is the responsibility of the captain of the home team to provide refreshments on match nights, as a matter of courtesy. Thank you.